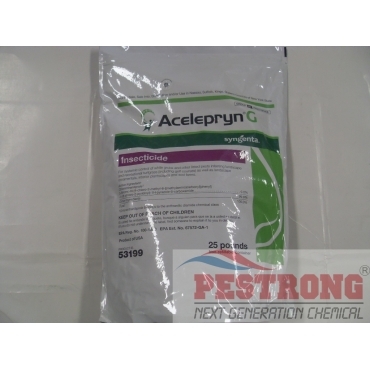 Where to Buy Acelepryn G Insecticide, Acelepryn G Granules Insecticide - 25 Lb - $102.95 for Sale with Fast Free Shipping! Acelepryn G Granules Insecticide - 25 Lb may be applied for the control of white grubs and other listed pests infesting landscape and recreational turfgrass (including golf courses) as well as landscape ornamentals and interior plantscapes. Acelepryn G granular insecticide may be used on plants or turfgrasses that are being grown for aesthetic or recreational purposes or climatic modification in or around home lawns, commercial lawns, industrial facilities, residential dwellings, business and office complexes, shopping complexes, multi-family residential complexes, institutional buildings, airports, cemeteries, interior plantscapes, ornamental gardens, wildlife plantings, parks, playgrounds, schools, day-care facilities, golf courses (tee box areas, roughs, fairways, greens, collars etc. ), athletic fields, sod farms and other landscaped areas. simply put, this works perfect.